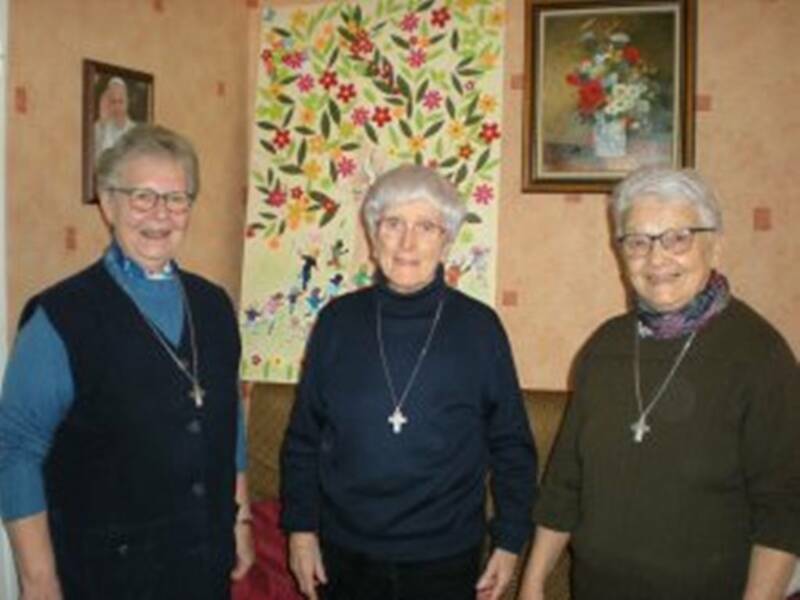 In Strasbourg, there is a small community of the Sisters of the Divine Saviour, who live in a social housing in the Ampère district. This neighborhood now has a better reputation, but 60% of the residents are unemployed and there are numerous families with a single parent. The sisters share the joys and sorrows of the inhabitants and are also engaged in other involvement. In front of the lift, a woman addressed to Sr. Marthe who offers her the cloths of her daughter's children. Everyone here knows the sisters, whose door is open to all. A neighbour comes to mend his trousers, a mother needs someone to take care of her daughter while she is going for shopping, neighbors are happy to have a piece of cake or a little Christmas cookies, etc. ... "We are perceived more and more as community ", says Sr. Marthe. "People ask us to pray for them. One Muslim family even told us one day that it means a lot for her that we pray in the apartment above her". Sr. Marthe, 77 years old, a true Alsatian who has worked 17 years as a home nurse in rural areas, says that the three sisters when they arrived in 2012 were helpless. "But today it is enriching to live in this neighborhood with all its well grown relationships", testifies Sr. Marie-Hélène. "It is nice to hear the laughter of the kids from the school below. It is never monotonous, because we experience many unforeseen situations. Above all, we make deep friendships here". Therefore, she is happy at the age of 83 to help the 4 girls in giving homework. "I help them to develop and they help me to continue". The community is attentive to the needs of the people, especially the poorest. The sisters participate in the feast of the district and the feast of the neighborhood - the house No. 32 in Wattwiller Street has won the neighborhood award. They are also at the meetings of the „Council Citizen of Ampère" to improve the living conditions in the neighborhood, etc. "We are part of the population and they are part of our lives", adds Sr. Marthe. Apart from the little help, the community wants to have "human and ecclesial presence". In this sense, Sr. Nicole and Sr. Marie-Hélène offer a first announcement for about 15 children and for believers who want to get back in their faith. Every three weeks there is a Eucharistic celebration, which also makes it possible to "meet each other and to exchange news about the neighborhood". In addition, in the beautiful prayer room, there is a map hanging with the various communities of the Congregation, where the sisters meditate the Word of God every day. They pray together Lauds and Vespers; they sing the Psalms and join "for the neighborhood, with the joys and needs of the people, for the parish and for the world, as a small unit in link with the universal Church". 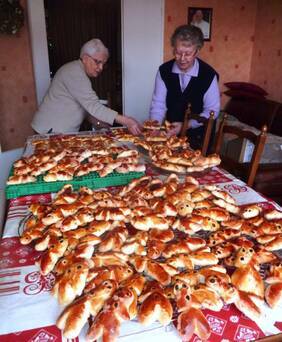 Apart from this on Sundays, they also take children to the Holy Mass in Neudorf-Port-du-Rhin. Sr. Marthe arrange an hour of adoration in the chapel with 72 other people. The sisters are very attentive to the life of their neighborhood; in addition, they are also involved in the city. Twice a week Sr. Marthe is available to welcome the family members of Elsau Prison and they visit homeless people as part of the ecumenical street pastoral ministry. Sr. Nicole, the superior, is responsible to organize a voluntary palliative service at the municipal hospital and at the Rhéna clinic (association of three hospitals denominational) after she worked full-time in this field. After closing the Catholic clinic St. Odile in Neudorf, which was run by the Congregation that the sisters asked their leaders to insert here, to the great satisfaction of the parish priest who was saddened for the absence of Church presence in this city. 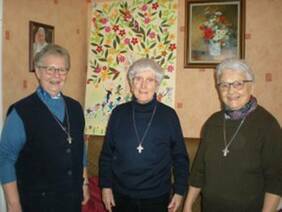 Inspired by the beatification of their foundress Elisabeth Eppinger (whose religious name Mother Alphonse Mary) on 9th September 2018, the three former nurses are now living their vocation in a new way: "united with God, giving their life", "stimulated by their fraternal community life“.